Cowboys DB is among the myriad of NFL veterans that participate in offseason training with Travelle Gaines at API. Photo by Travelle Gaines. Travelle Gaines gets people to do things they never thought they could. Considering that most of these people are elite college and pro football athletes makes his job fascinating. Gaines lacks the formal education of a trainer (kinesiology, physical therapy, etc.). His educational process was more old school: apprenticeship and experience. A former college football player and workout warrior, Gaines credits legendary LSU strength and conditioning coaches Tommy Moffitt and Gayle Hatch for what he’s learned about training. Gaines has clearly taken these lessons and added his own perspective to develop a clientele that includes some of the best football players in the world: Chris Johnson, LeSean McCoy, Percy Harvin, Bob Sanders, Jon Beason, Matt Hasselbeck, Ryan Mathews, Marcus Trufant, and over 100 others. Gaines is now the director of Pro Training at Athletes’ Performance Institute. He agreed to take some time to have a conversation about his career, his role and process with training football players, and the transition required to go from college to pro football. Waldman: So why are you and Athletes’ Performance a great match? Gaines: At Athletes’ Performance I’m in charge of football and combine training and NFL veteran offseason training. Financially our numbers have doubled, our participation in combine training has doubled, and our NFL veteran numbers has tripled. This year it’s been a helluva ride. Now 2012 is going to be bigger and better than ever. We now have a lot of stuff in the media. We have our television show NFL Network Game Changers going into Season Two. It’s just a blessing and an honor to be a part of Athletes’ Performance and to be in that building and that realm. Waldman: It’s a prestigious role. Gaines: I get to be one of the most influential people in sports. Through Athletes’ Performance I get to work with the best agencies. If you’ve noticed, there’s probably about 10-15 agencies in the NFL that controls the draft. We’re talking about CAA, Joel Segal, and Octagon. Of those 15 agencies we probably work with 13 of them. So when you’re leveraging the top agencies with the top players with the top trainers, you have a lot of leverage with who knows who and what goes where. It’s been a blessing to work here and a blessing to have a lot of great athletes to come back here and work in the offseason. It’s just been a great ride and I continue to work 24/7 because I want it to get better. My goal is to lead Athletes’ Performance to become the undisputed leader in Combine and Football Training and I’m not going to rest until it happens. Waldman: Good for you…from the standpoint of the athletes, what do these NFL prospects have to learn about taking care of themselves that wasn’t as clear to them as college athletes? Gaines: You hit it on the nose. They have to learn how to become professionals. In college, everything is structured for you. From the time you have to wake up to go to meetings to the time you have to go to class. There’s people checking the class to make sure that you’re there. People checking to make sure you’ve worked out. If you don’t work out then you have to come in the morning to do extra conditioning. Then there’s study hall. If you get into trouble there’s consequences for everything at college. Once you become a professional athlete it all changes. First, on the field. If you don’t lift, you don’t lift and you get cut. If you don’t condition on your own they don’t condition athletes in the NFL. If you don’t condition, you’re out of shape. You get cut. If you don’t study or learn your playbook so what, you get cut. The things where people constantly had their thumb on you in high school and college is not there. You’re expected to do it because you’re paid a check every Tuesday that’s a lot of damn money. On the flip side everybody knows how much money you make. You can go to ESPN.com and find out how much everyone in the NFL makes. Everybody knows. If you say you don’t have the money, you’re lying because I can look it up. You become a target. You have to deal with your family and dealing with the people that you love in this arena is a very tough thing. I know, I’ve experienced it myself. Telling your friends and buddies is a tough thing. People who want to mooch off you is a tough thing. The attention you get from females is a tough thing. Waldman: There’s a lot of shame involved with it. You want to be loyal and loving and be the type of person where you can help people. But you don’t realize the magnitude of how people will manipulate for what they want – even those you love. Money just multiplies the intensity. Gaines: Absolutely, so when you look at all of those things it’s a major problem. One thing I’ve always done and we do at Athletes’ Performance is that with my training I’ve created a brotherhood. I’ve always gone above and beyond with the guys that I’m training. I’ve always tried to tap into my education and counseling thing to be there for the guys. That’s all that training is. Training is getting guys to think and believe that they can do something that they’ve never done before. That’s what I do with every guy that I train. I get the most out of every single person that I train. The common thing for people training with me is that they are now doing stuff that they never thought that they could do. That’s one aspect of what I get out of people. Two, is accountability. I hold everybody accountable. It’s not okay to come late to training. Three, I surround them with people that they need to be like. People say, “Hey Terrelle, you train 100-200 guys a year. That’s a lot of guys,” but in the grand scheme of things it’s not.There’s 1800 players in the NFL. Waldman: But you’re still training a ton of NFL players. Gaines: Yeah, I do train the most guys in the country, but I train a small percentage – about five percent of the NFL. What I do get is the five percent of guys who want to be in the NFL and will work hard. That attracts other people who want to be like them. When Taiwan Jones is there training so is Terrell Owens. So is Tom Brady. There are guys they look up to that have the work ethic that they need to have every single day. When Blaine Gabbert was going through Combine Training at Arizona with API he was training with Matt Hasselbeck. There’s guys who come back and they have a lot of interest in training with guys who are just getting started. We create that brotherhood and bond so guys come back every year and want to train and be a part of what the guys are doing. Waldman: One of the things I question is the idea that athletes never have self-doubts or self-esteem issues about their performance. Do you interact with players who have these issues and are there players who really have no doubts about what they can do? Gaines: There are a lot of players on both ends. [One one side of the spectrum] there are players like Tom Brady. You know, there’s something about kids in this one region – kids that grew up in the San Francisco Bay area. I don’t know what it is about those kids but they have the exact same chip on their shoulder. All of them. Tom Brady. Maurice Jones-Drew. Julian Edelman. T.J. Ward. I could go on and on and on, but think about all these kids all have the same kind of complex. If you did any research on them they probably all kind of have this Angry Man complex. I don’t want to say it’s a Little Man complex because Tom’s not little, but just listen to the things that they say. Tom is draft in the 6th round and he says I’m going to be the best…Maurice Jones-Drew wears No.32 and he says he’s wearing it for every team that passed him up. It’s their work ethic. I don’t know what they feed them up there or what’s in the water, but their work ethic and their attitudes in that region is filled with self-confidence and they always want to prove people wrong. Maybe it’s because it’s a blue collar area up there. I’ve worked with all of those guys I mentioned so I’ve noticed that. Then you have kids who have lower self-esteem for some reason. Maybe they’ve been cut or something else. It’s a wide spectrum you get from players. Waldman: There are are a lot of training programs that are known as “speed schools,” but I know you’ve always take the approach of developing a good football player. How do you go about that? Gaines: All the workouts that we assign for the athletes are position-specific. We don’t have a lineman running 300-yard shuttles. Then we also have position coaches that come and work with the guys. For example our outside linebackers and d-ends worked with Willie McGinest, our offensive linemen worked with Jackie Slater, our wide receivers worked with Edell Shepherd who was a pro. We get our guys working with former NFL players and coaches to give them the technique and then we work with the coaches to find out how to prescribe them into their workouts every day. Waldman: Do you have any views about the Combine and the effectiveness of it determining a football-ready prospect? A guy like Greg Cosell, whom I have tremendous respect for but is a football theorist in the sense that he has no practical game experience, gives the opinion that exercises like the 40-yard dash are irrelevant to determining a good football player. He believes something like lateral speed and acceleration are more important than running 40 yards in a straight line, which is rarely a part of a play. What’s your opinion of the Combine’s usefulness to evaluate prospects? Gaines: What the combine is for is just to see how athletic the guys are. Granted, there are a lot of players in the NFL – a lot of players – who aren’t that athletic, but unbelievable football players. And there are a lot of people in the NFL who are very athletic and aren’t good football players. I think it’s a way to get the guys outside their equipment and get a closer look at them to see their speed, to see short area quickness, to see their change of direction, and to see their explosiveness. That’s all it is. I don’t think it really equates to how good of a player a guy is. But one thing I will tell you is that when you look at all of the explosive players in the NFL there is a direct correlation to their vertical jump and their broad jump. 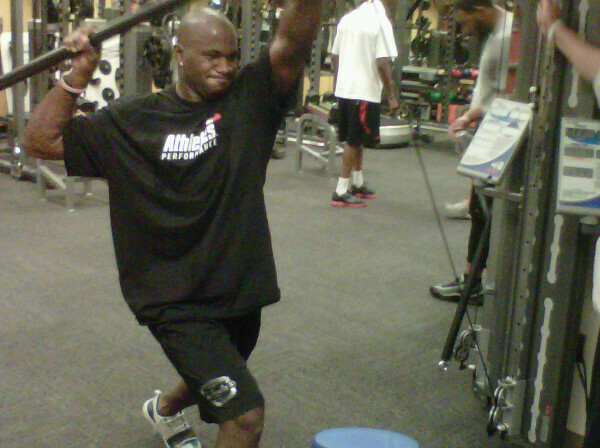 Look at Vernon Davis 42-inch vertical jump. Adrian Peterson, 42-inch vertical jump. Percy Harvin, 40-inch vertical jump. You look at those guys…Julio Jones, 11-foot broad jump. When you look at guys who are very explosive it does equate to those measurables. Now you can get those guys who can bench all day and get shoved around the football field or they can run a 4.3-40 and they can’t catch a cold. So there’s pros and cons to everything. Waldman: I had a friend who used to play intramural basketball with Hines Ward. He would tell you that Ward was nothing special as an athlete, but it doesn’t take away from his skill as football player. I think he’s a good example of that. I would think diet would be a big deal with these guys. They’re so young and bounce back so quickly at their age, but they grow up eating anything and they don’t realize the impact. I watched Cam Newton on an ESPN show last spring where he’s making breakfast before he trains and he’s eating some sugar-coated cereal. My first thought was I wonder what he’ll be eating a year from now if he’s worked out with Travelle? Do you see a lot of guys who just didn’t have a strong education about diet? I think it’s a common societal issue at large. Gaines: Absolutely. A lot of it is regionally based. When you get kids down South its a lot of gravies and sauces. It’s regional based and kids only know what they know. You’re going to eat what you’re comfortable with. Once you figure out how to eat right and fuel your body you’ll realize what to cut out to get leaner or eat more of to get more energy. It not only helps you become a better athlete, but it helps you think better and be more conditioned. Waldman: How do you work with young athletes with their approach to the media? Gaines: I think when it comes to the media we provide training to be careful about what they say and the words they use along with their facial expressions to convey their thoughts. Because once you say something it is out there. The media can be a huge crutch or a huge tool for you depending how you approach it. You can gain a lot by having the right message, the right approach, and a good fan base behind you. It can also be the difference between keeping a player who knows how to talk with the media and cutting a player who doesn’t if you’re one of those bubble guys. Waldman: What about physical flexibility? Do you guys work with players on it? I remember reading about Donte Stallworth and that he was a very tightly-wound player. Is there any correlation to explosiveness and flexibility or the lack of it? Gaines: Everybody is different. One of the guys I was working with and helping with the Raiders was DeMarcus Van Dyke. He was the fastest guy at this year’s combine. He was stiff, stiff, stiff, but he ran a 4.28. Then you take another guy who is very flexible and he might run a 4.7. There’s not a correlation to speed or health. However you’ll also find guys who are stiff and aren’t explosive while there are also highly flexible, highly explosive athletes. Now I would believe that the more flexible you are the less likely you are to get injured. I really believe that. We do flexibility and regeneration of the muscles before and after every workout. I think one guy that came in and really improved his flexibility and overall athleticism was Tampa Bay’s rookie linebacker Mason Foster. He’s a guy that came in and was very stiff, was not as athletic as he could be. However he really honed it, changed his diet, worked out, got flexible, got in better shape and put his talents on display at the Sr. Bowl and at the combine, which helped him get into the top 100 picks in the draft and elevated him to a starting role with the Buccaneers. I believe he had double-digit tackles last week. Waldman: Any common advice coming from veterans to the younger players that you see at your programs. Gaines: Yeah, the common thing is “take care of your body.” Stretch before and after every workout. Take the time to recover and regenerate. If you’re going to go out and party then go out and part, but take the time get your sleep and rest and take care of your body. Another good read. I love the fact that you are mixing the articles up with players, trainers, tape grinders, etc. Hey Travelle, what’s up bud, you come a long way from, Moreau LOL….coach brooks….give me a shout man at my email address ….and to think, i was going to be coaching with you here in Calif….happy for your success…i need some info from you Bro.